Happy Mother's Day, Michaela. You are my first child, long desired. You made me a mommy. Yours is the first little hand that wrapped itself around my finger, the first one to say the word "mama" and mean me. You were the first one to take a piece of my heart to carry around outside my body. I can still see your big blue eyes, looking up at me with so much trust. And now, of course, my own eyes are filling with tears and my heart aches with the sorrow of not being able to live up to that trust. I remember when Johnna was a baby, she was fussy, and I was soothing her, saying, "It's okay. Mommy is here. I love you. I will take care of you. I will protect you." But then I stopped and my eyes filled as I said to her, "Well, I was not able to do that for your sister, was I?" But I love you, my dear sweet child. I know you far from being a child now, but to me you will always be, just as all your brothers and sisters are. I am always your mother, will always love you, will always care for you, will always do everything in my power to help you and protect you. I only wish there was more I could do. Someone interviewed me the other day about Mother's Day, and I told her that you were always present with us, that the whole family was always aware of you at every holiday. Here is some solid evidence of this. I woke up this morning to find this gift from Robbie on my car. My Mother's Day gift from Robbie. I previously had bumper stickers made, but they faded terribly. This will never fade. It will always stay bright, like my hope for you, and my love for you. But I have actually already planned how I could make a sticker that says "found" and place it over "missing." May that day come soon. I always end my entries with a line from this book, which we used to read together. But perhaps I should include the whole thing. Love is something unconditional, that can never be damaged. But it is equally important for you to know that I like you forever also, whatever you may have been through. Sharon...my first visit after just reading about Michaela. There is no way I can comprehend the hell you've gone through. I will add Michaela to my prayer list, along with so many missing children. From one Mom to another ((hugs)) and Happy Mother's Day! Happy Mothers day Sharon. To me you are one of the greatest examples of what a mothers love is all about! Any chance the kidnapper may have visited this site? Perhaps monitor visitors and/or frequency of visits? A long shot but you never know. God bless you and your family. Carol S.
It is entirely possible, but there are a lot of people who visit this blog frequently. I think it would be a very sad thing to start monitoring them and suspecting them of being kidnappers. To be quite honest, we already have far too many leads in Michaela's case. Finding the time and resources to thoroughly investigate the real leads we have is very difficult. We just don't have extra resources to be trying to construct leads from nothing. Everybody should feel safe coming here. If anybody has anything to report or any leads, send me a message or e-mail. Sharon, Happy Mother's Day. It is not your fault that Michaela was taken. In your attempt to let her grow and do things on her own she was taken. You did nothing wrong. The kidnapper was bound and determined to get a little girl that day. If not Michaela, someone elses little girl. I know what you are thinking. (If only I wouldn't have let her go.) You had no way of knowing. You taught her well and how to be strong. Michaela knows you love her and I am sure she never blamed you. I hope you are having the best day you can have with your other children. It is Michaela's turn to be found! Don't give up hope. She is out there somewhere. Happy Mother's Day to a lady who has a beautiful and powerful mother's heart. I love that you haven't given up on Michaela despite feedback you often receive. With so many victims being found over the past few years, you really can not give up. I saw Morgan Nick's mom on TV and she indicated she would not give up until someone could prove her daughter was dead because she could be alive. 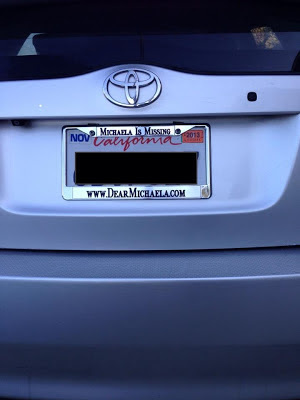 I hope Michaela is reading and will be found soon. Happy Mother's Day to you Sharon. This day must be bittersweet for you. You're amazing....I just heard about your daughter for the first time...don't ever give up....you are an amazing soul!!! Thanks! The video is great. I loved all the mamas and babies. here in the silence of memories. angels will find you, by your whisper. And always with you, they watch over you. that may you find a sense of comfort there. Happy Mother's Day Sharon! You're blessed to have such wonderful, thoughful and sensitive children..who know your heart- I'm amazed that Robbie came up with this gift for you...you're blessed and wherever Michaela is, she feels this love. I hope Michaela will read this beautiful letter from where she is now.. you are an amazing woman and I really wish for you to be reunited with your daughter. Hugs from Italy, to you and your family. Dear Sharon, sympathies first of all! NO ONE should have to go through all of this. Secondly, you mentioned that you received hints that your daughter may be in UAE. Have you contacted the UAE CID (Criminal Investigation)? They are extremely efficient! Have they actually searched for her in UAE? I am not aware of UAE CID. How would I get in touch with them? Our investigator contacted a missing children's task force, the FBI, and National Center for Missing and Exploited Children, and it was my impression they just ran into a wall. The National Center contacted the US embassies in the UAE. But the thing is, there isn't tell anything solid for us to investigate. The man who initially gave me the information suddenly came down with complete amnesia when he was contacted. He was in Russia, and I work with an attorney from Russia who got in touch with him. If we ever got more specific in formation, like where she is or who she is with, we would probably want to get some local law enforcement involved, but if we just say we have a girl who has been missing for 25 years who might be somewhere in your country, is there anything they could do? I just hope for the break we need, which is for Michaela to get in touch with us, or for one of these people who appears to have actual information, to give us what we need to try to find her. But I do thank you for the suggestion, and if you could give me more information I'd appreciate it. Thank you. The thing I have been trying to achieve in the UAE is actually media coverage for Michaela's story and my blog, to try to get word out to Michaela or to someone who knows something, who could help us. You are in my thoughts Sharon. I'll pray for precios Michaela and her safe return to her family one day. As long as life goes on there are still a chance for a miracle. Keep on fighting..